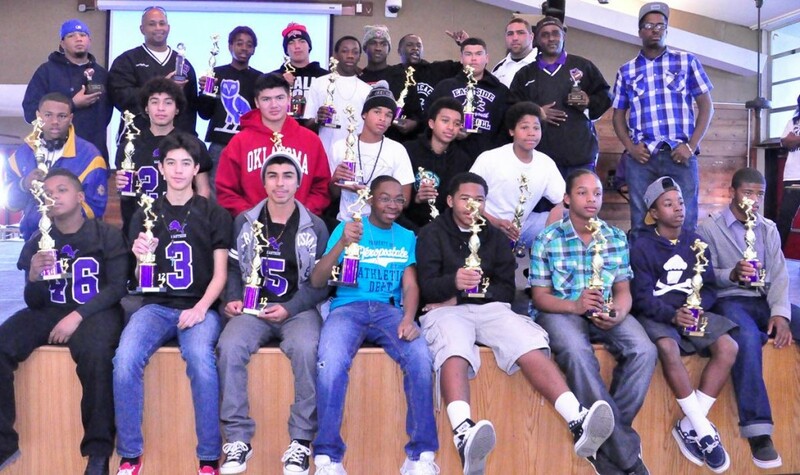 The Eastside Lions of Lancaster celebrated their “Super Bowl” win with a trophy presentation Saturday (Jan. 19) at Antelope Valley High School. Each player was presented with a “Super Bowl” ring. LANCASTER – The Eastside Lions of Lancaster were $7,000 in the hole at the start of the season, after a vendor took the team’s money but failed to produce their custom jerseys. The youth football team worked hard to turn the tragic story around, said President Robert Lopez. 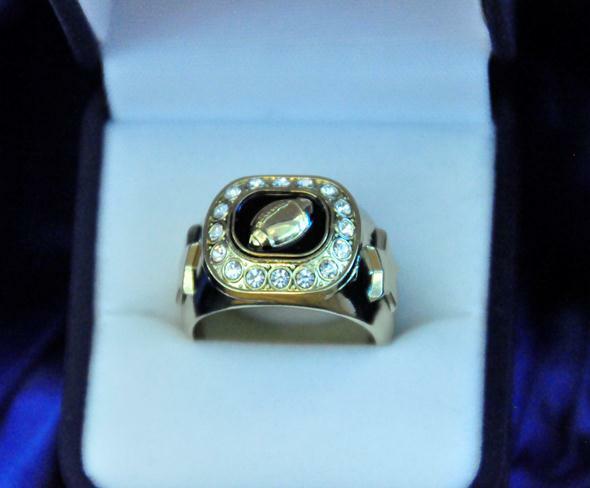 Saturday afternoon, the youths were rewarded with trophies and super bowl rings for their win, and more importantly, for their optimism and triumph in the face of adversity. Special awards were also presented to outstanding players. Quanta Cammon Jr. and proud dad. This was an outstanding day where every player was given their due and went home wearing a smile, according to team treasurer Caroline Roth. Helping with the presentation was the Executive Board of Directors, President Robert Lopez, Vice President Jeanice Boullard, Secretary Melisa Simmons, Treasurer Caroline Roth, Concessions Director Roxanne DeMoica, Commissioner Michael DeMoica, Chapter Athletic Director LaTanya Tobias, Cheer Director Jessie Delgado and Football Director Ali Daniels. Assisting the Cheer Director were Jane Luna and Maricela Cardoza from Team Cheer. The Eastside Lions are proud of how far they have come and are looking forward to an exciting 2013 season. Early registration sign-ups will be held from 11 a.m. to 3 p.m. on Saturday February 2, 2013 at Round Table Pizza, located on 10th Street West in Lancaster. For more information, contact Caroline Roth at 661-917-1428 or email eastsidelionsfc@yahoo.com. All inquiries are welcome. Eastside Lions President Robert Lopez. Eastside Lions of Lancaster Youth Football & Cheer is a non-profit organization in Lancaster. 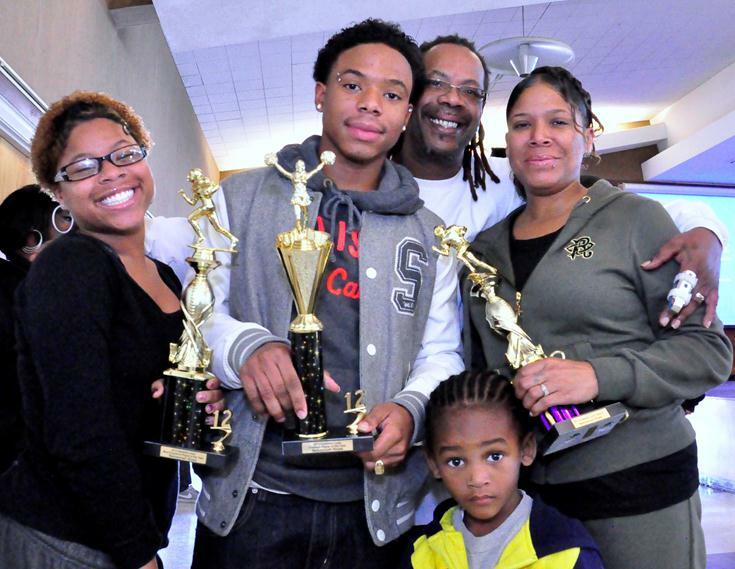 The organization services a diverse community of young people, ages 6 -14, by offering up a safe and sane youth sports program aimed at keeping young people off the streets and giving them an outlet to practice good team sportsmanship. “We successfully sponsor some of these hard hit young people, which allows them to participate in a sport they might otherwise not be able to take part in. They work hard in return for this sponsorship and are grateful for the opportunity to play,” Lopez continued. “I was approached by George Josephs who is the owner of Corsair which is a sports apparel manufacturer located in Long Beach. He got our name from the conference website that we belong to which is located in the High Desert. He presented a proposal to manufacturer custom made game jerseys for our team at a reasonable price and in a timely manner. We worked together going back and forth with jersey designs and finally settled on one that was beautiful and one to be proud of. 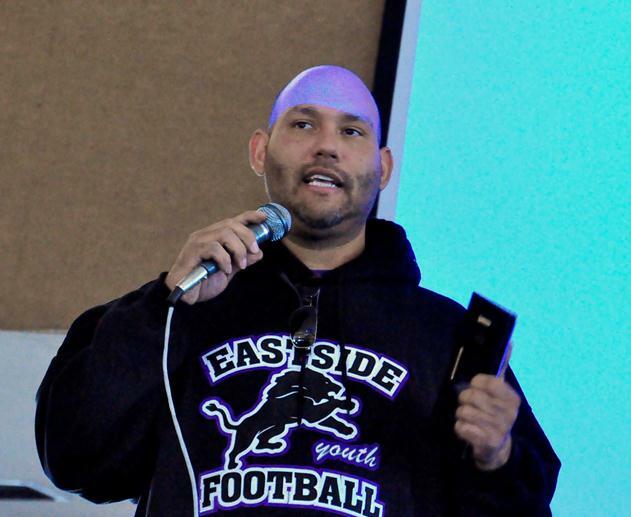 In return for an agreement to provide 240 uniforms with a delivery date of end of July or early August, the Eastside Lions paid Mr. Joseph the sum of $7,000.00. Since the beginning of the season, the look of excitement on our young peoples’ faces when they looked at the sample of our uniform was priceless. We couldn’t wait for distribution day, which was to be followed by picture day on 9/23/2012. 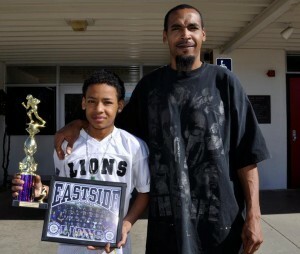 5 comments for "A day of honors for Eastside Lions of Lancaster"
The kids have to have good grades to play. They have to turn in progress reports and report cards. These kids are excellent.. I was the A.D. for them & they are a special group Of young men.. I’m Proud of the EAST SIDE LIONS FOOTBALL & CHEER…Bringing it home with all the troubles being left in the dust.. Stealing from Kids…Wow… God can deal with him better than any of us…. What about excelling in academics? Who said these guys weren’t excelling in academics? As a matter of fact the boys need to be doing good in school just to get on the team. So there!! This story is not about academics, it’s about sports. Now can’t you just congratulate them for the victory and be done? Great job boys!!! Congratulations Lions! Way to overcome. Football players and cheerleaders must maintain a good grades to be able to participate kids also recognized for their good grades.